Speechpad Review: Is Transcribing for Speechpad a Scam or Legit? Speechpad is a transcription service provider headquartered in San Francisco, CA. They don’t require much to get started which makes it perfect for beginners! In this review, I will take a look at the transcription job that you can do from home. If you’re interested in making an online income transcribing, we highly recommend checking out the course at Transcribe Anywhere. They also have a free course you can check out to make sure transcription is right for you! Earning money from home as a transcriber is great, but I prefer a much more passive method, check out My #1 Recommendation, it’s how I made over $13,000 online last month! You’ll need a computer, internet connection, and headphones. A foot pedal may also help. All of the transcription jobs you will get with Speechpad can be completed using their transcription console. However, you can use your own transcription applications if you choose. If you decide to work outside of the Speechpad console, you will have to comply with Speechpad’s Worker Confidentiality Agreement. To apply to work for Speechpad, click on this link. At the time of my writing this, there is a notification that says they aren’t hiring right now. But you can fill out the form to be notified when they are accepting new applications. The good news is that you know they don’t hire more workers than they have work available. So when you do have an opportunity to transcribe for Speechpad, you know there will be work available for you! How Much Does Speechpad Pay? 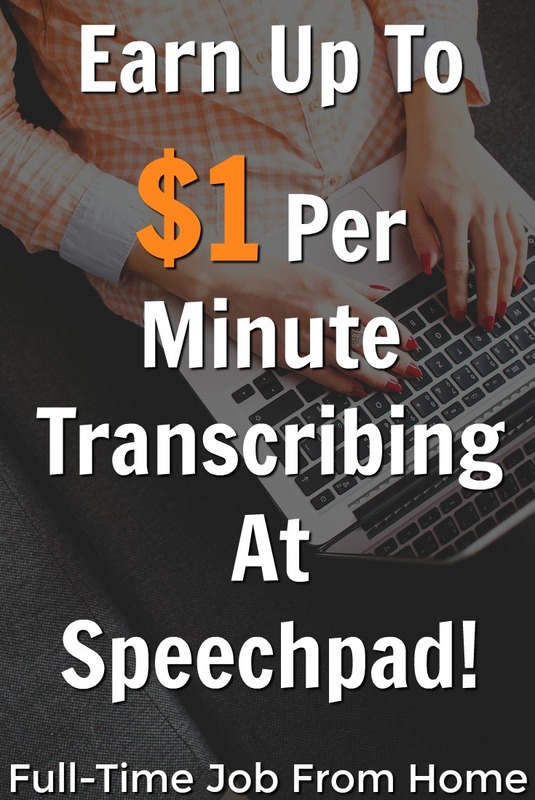 All Speechpad jobs are priced per audio minute. Transcription jobs range from $0.25 per minute for entry-level to as high as $1.00 per minute when more experience is required. Captioning jobs pay between $0.30 per minute and $1.00 per minute. Review jobs pay between $0.20 per minute up to $1.00 per minute. Review jobs are offered by invitation only for contractors who consistently produce high-quality transcription or caption work. You could also receive bonuses when customers rate you highly. Speechpad pays contractors every Tuesday and Friday. They pay in US dollars via PayPal. You’ll be paid for any jobs submitted and approved since the prior payday. Speechpad will hire you as an independent contractor, which means they do not withhold taxes. Your schedule with Speechpad will be whatever you choose. You can work as much or as little as you want. You’ll also get to choose the jobs you want to do. If you have a full day with nothing to do, you can choose a larger job. Or if you have a little time to spare, you can find a small job to do. They just ask that you give yourself enough time to finish projects that you take on. One reviewer states that you can listen to a snippet of audio before you choose to take on a job. So you’ll know what you’re getting yourself into before you begin. Does it Cost Me Anything to Work for Speechpad? No, Speechpad does not charge anything to have an account, nor to take any qualification tests. During the application process, you will take a basic transcription test and a grammar test. Neither of these tests will cost you anything. If you’d like to transcribe faster, they do recommend a headset and foot pedal, which is an additional one time expense. There are some in-depth reviews on Glassdoor. One review states the pay ranges from $0.20 to $0.75 per audio minute, and claims it would be enough to make a living if needed. This review also states that this rate is much better than most other transcription companies out there. One reviewer said that Speecipad is a great place to get started transcribing. Sometimes there is an abundance of jobs to choose from, and other times there is little. It was said that once you get past the basic qualifications, you’ll have more jobs to choose from. You can also work where ever you want, as long as you are complying with the confidentiality requirements for their clients. Is Working at Speechpad a Scam? Based on my research, I believe that Speechpad is not a scam! If you want to give it a try, here’s the link to apply! If you’re interested in increasing your transcription income, we highly recommend the course at Transcribe Anywhere. It will give you the tools to find long-term high paying transcription jobs. You can also check out their free 7-day course to make sure transcription is right for you!